This basket has a length of about 10.5 in, a width of about 10.5 in, a height of about 2 in and a Net WT of 3.5 pounds. 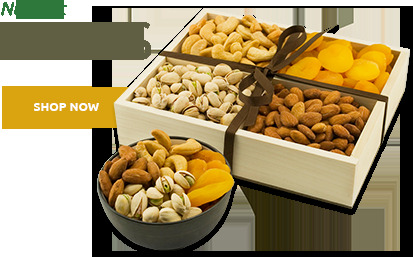 A generous assortment of healthy, soft, naturally sweet, plump dried fruits and nuts. They are beautifully arranged in a reusable wicker tray. 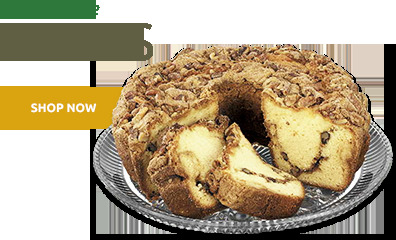 A thoughtful gift for the health conscious on your list. Contains: Salted Giant Cashews, Colossal Pistachios, Salted Jumbo California Almonds, Jumbo Apricots and Dried Pineapples. Fruit and Nut Basket - Net WT. 3.5 lbs. 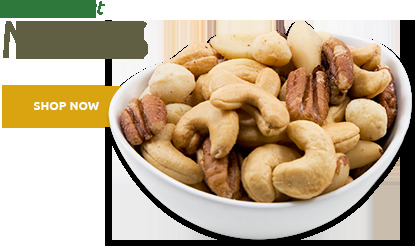 Pistachios, Cashews, Almonds, Apricots (Apricots, Sulphur Dioxide), Pineapple (Pineapple, sugar, sulphur dioxide), Peanut Oil and Salt. It was sent as a condolence gift, arrived sooner than originally predicted, holiday time, & was much appreciated by the recipients. Thank you! Was running late in ordering a birthday gift, and Superior Nut Company got this package to the birthday party with 3 1/2 hours to spare. They loved the arrangement of nuts and fruit and received it in time to share with guests at the party. This is the second product I've ordered out of a total of three. Probably will place future orders. ProsExcellent service. Product nicely arranged in a lovely basket. I ordered nuts and dried fruit the person that received it said is the best I have had. Now I told my sisters, brothers and friends how good their products is and they will order too. Exact words from my brother in law were "Thanks so much for the nut and fruit assortment. after I eat all of what's in it." That sums it up. Excellent! dried fruit and the nuts, and loved everything in the basket. I will definitely order this product for gifts again. 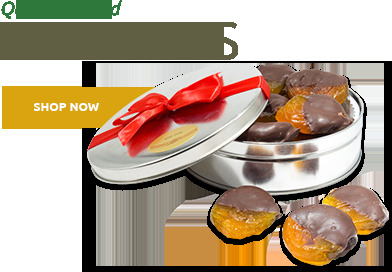 ProsIt is a healthy alternative to candy and baked goods for the holidays. The gift basket was delivered in good time for Christmas. Since it was a gift, I was not able to personally sample its contents but was assured that everything was delicious. I buy this for my parents every year for Christmas and they love it. I've never actually tried it, but my picky father raves about it. Makes a great gift. Has always been delivered on time. Great to give as gift! Gave this to my mother and she was thrilled! She loved all the nuts/fruit and was impressed with the packaging as well as the size of the basket. Super speedy delivery as well. ConsWould like photos of the items to have something in the photo to give it scale. A comparison item that has a standard size. Sent as gift for Valentines Day to appeal to guys & dieting sister. So much better than candy!! They loved it & said the quality was "Superior". Will definitely use again! the basket arrived in very good condition and everything was in good order. The only problem we had was that it was not delivered on the promised date, and it was a gift so that was a little upsetting. ConsExpected it to be larger. Beautiful and had a variety of what I was looking for, everything was very fresh!! they made an error was really upsetting. I had several emails and phone calls. Never did anyone admit that they goofed and didn't follow the ship to arrive date. I actually wrote a letter to Harry Hintlian regarding your customer service. This particularly Fruit and Nut Basket is really nice, and I was going to send some for the holidays to others, but will go back to Harry and David due to this situation. Bought this for our friends' 40th anniversary and they loved it. They are both sensitive to high glycemic foods so this made the perfect gift. Delivery was fast and shipping and display packing excellent. It was our first purchase but definitely not our last. Thanks Superior, nicely done. This was a Fathers Day gift. Our Dad said he was considering hiding it from Mom... they both really enjoyed it. Quick shipping and excellent value. As usual everything went well with my purchase from Superior Nut. The quality was great and the requested time of delivery was exact. I have been buying from this dealer for three years, and never had a bad experience. Excellent selection. The recipient was "over the moon" at the presentation and contents of the gift. ProsThe nuts and dried fruit are are as good as one can buy. This was a gift for my sister, we all have different tastes in choice of nuts and dried fruit. I was disappointed in the lack of selection for dried fruits. No other options, either choose what you have put together or nothing. For price charged, I think more should be offered. To date, the cakes have not been tasted, so I can't offer an opinion. Merchant Response:Our Custom Gift Basket offers you the option to chose what you want in the basket (over 200 products to pick from). I received as a gift last year a wonderful tin of your nuts. Because I was so impressed with the quality and freshness, I sent a package to friends, who recently moved to their new home. Hopefully, they enjoyed them as much as we did. Got this for my husband, who loves nuts. He's been working on them steadily since he got it several days ago. He especially loves the GIANT cashews. The agent said that these were shipped by weight and we might get another one with exactly the same problem. I completely understand that in the picture they probably add more product to make everything overflow like a bounty. (!) But there should have been more than 4 slices of pineapple in my 3.5 pound box. It was a gift as all of my orders have been. I will still order from superior nuts but will not be ordering this particular item. ProsBeautiful presentation and delicious fare. ConsVery little pineapple which was disappointing and should not have been the case with a 3.5 pound item. 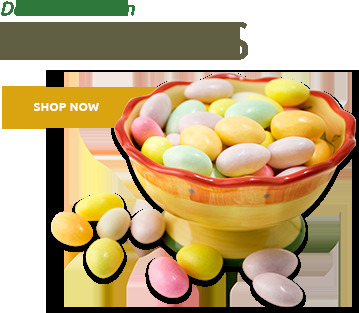 I have sent several of your gift baskets on different occasions and have had the best luck. I get such good compliments from my friends. Pleasure doing business with you. Fresh, delicious, package is attractive with the environment in mind because the basket can be reused. My staff fought a little (pleasantly) over who would get the empty basket. Good quality nuts and dry fruits. The quantity was much larger than I realized. We are still eating off of it, after two weeks. Quite a plus, since it has stayed fresh with aluminum foil wrapped around it. ProsSelection and size. Cashews, apricots and almonds were excellent. ConsThe only change I would make is to include dry roasted pistachios, but that is a personal preference. The pistachios included did not taste dry roasted. Was a gift for someone that I knew would receive lots of flowers so I wanted to do something different. Was a big hit. I have since ordered another for someone else. ConsExpress shipping a little high but was worth it. Gave as a gift to someone that probably receives specialty gifts often and she was very pleased. Everything was fresh and yummy! Fruit and nut basket 93.5 lbs. We recently bought this fruit & nut basket to send to a friend when his mom died. It was out of state and we were unable to be there for support, so we decided to send this to let them know we were thinking of them. They loved it! It was delivered right on time, exactly when Superiornut said they would deliver it. I made a mistake on the order and noticed it immediately after I submitted it. I emailed CS and then followed up with a phone call. The CS agent was very nice and helpful and got it straightened out promptly. I will use Superiornut in the future and would recommend them to all of my friends. I always like to get my mother-in-law things she enjoys for her birthday but it is difficult sometimes. She enjoys nuts and I bought I would give this a try. She seemed to like it. ProsMy mother in law seemed to really enjoy it. ConsI was unable to see the size and quality to know if it was worth the money. Prosprice, free shipping, plus you sent me a discount promo. Bought it as a gift, and it was well received. ProsEverything tasted great and looked wonderful! ConsWell, we all want more for our money, don't we? I wanted to send my parents a gift for Valentine's Day that was something different and of the non-chocolate variety, so I sent them the fruit and nut basket. They ranted and raved about the size of the cashews and how good everything was. All in all, they loved it! ProsVariety. I liked that it was fruit AND nuts to bring a little sweet to the salty. ConsThe almonds were salted. The description did state this, so it's something I was well aware of, and chose to order anyway. Not sure how they tasted, but my family doesn't usually eat salted almonds, so I thought it was a bit unusual. Parents loved the gift. Didn't want flowers or chocolate and this was a healthy alternative as a great anniversary gift. The company provided excellent service, assisting me in placing orders for several friends and relatives. 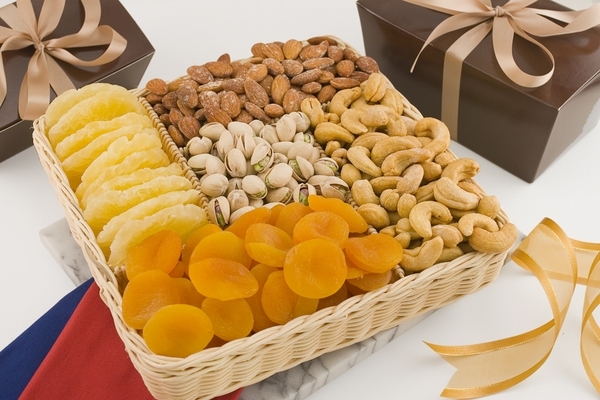 The nuts and dried fruit in the basket we ordered for ourselves were excellent, and we received several good comments from the people who received our gifts. I acctually sent these to my dad for his birthday and he loved it! It was such a great gift idea because my perants love nuts and dried fruits. Thank you so much for a great product and service. Just the right thing for our colleague whose uncle had passed away. She said it was nicely presented and the nuts and fruit were very fresh. This gift basket made 2 people very happy. It was not only beautiful to look at, but was the best fruit and nut basket ever tasted. Thank you, Superior Nut Company, for providing a superior product. I ordered this as a thank-you gift for friends of my mother. The gift arrived promptly and I received good comments about the mixture of fruits and nuts. It seemed to be very much appreciated. I, too, liked the selection on your site and was impressed with the prices. You provide a very high quality product for a reasonable price. Thanks! !